Happy Friday friends! Hope you had a great week. It was a good one here. Wednesday, as I mentioned Monday, I had a coffee date with Joyce. You might remember Joyce from this post, she's a long time local friend. 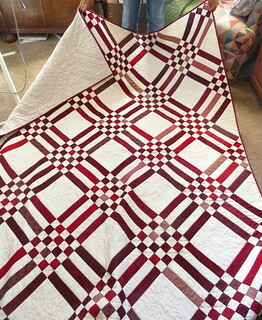 I met Joyce at Going to Pieces, a quilt shop in Pleasanton, where I took a lot of classes from Joyce and ended up working for quite a few years. The weather was wonderful, warm but not hot, and we sat outside and enjoyed her spectacular backyard. 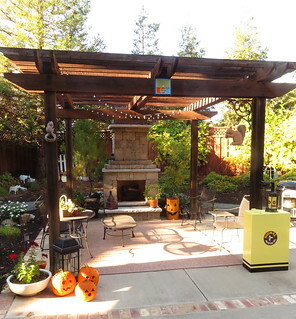 I'm all about those outdoor spaces and Joyce's backyard has me totally wowed with the potential of having a nice backyard that's still nice even in the drought. Joyce and Mike, her husband, built that fire place last year from a kit. WOW. Totally dying over it. They removed some of their lawn and added paths and a lot of mulched areas to cut back water usage. 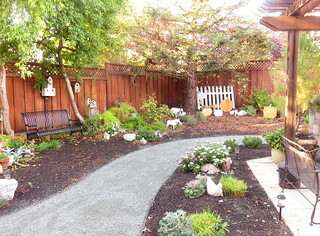 I love the path that goes all around the patio, perfect for her grandkids to run around. She's got lots of interest with birdhouses and garden statuary and fun seasonal elements like the pumpkins. California has the perfect weather for this kind of outdoor living. 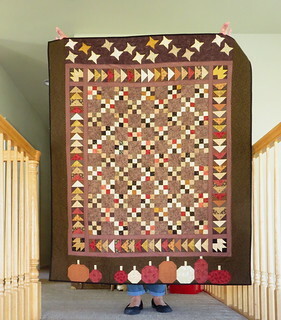 Joyce is still a prolific quilter and you can find TONS of quilts of all sizes through out her house. 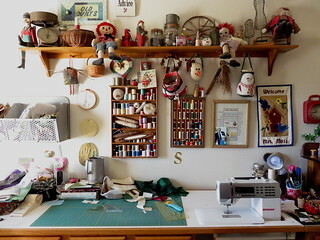 I thought you might like to see part of her sewing room. 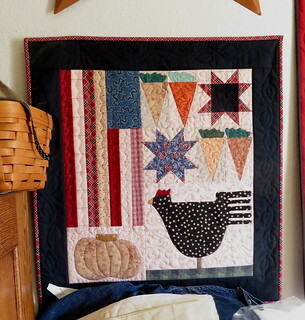 I love this mini quilt hanging in the sewing room. These are just a few of the quilts she's made recently. 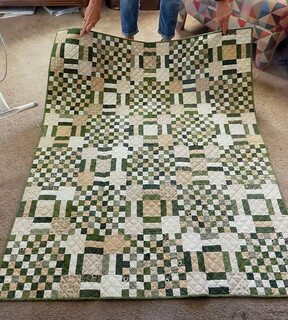 Joyce does all her own machine quilting too. She loves sewing and knows how to squeeze progress into the tiniest slivers of time. More on my visit to Joyce's next week. 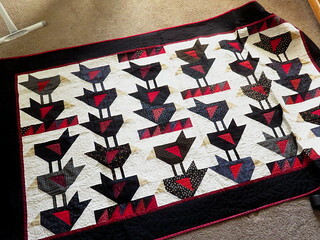 I like the quilts, especially the one with the black birds. Is there a pattern available for that one? Such an inspirational post! Would like to know the names of the patterns. Have a great weekend Pam! Love all of Joyce's quilts and her yard...especially the fire place. What an inspiration she is! 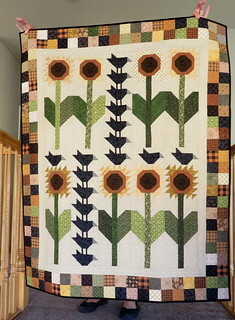 I loved seeing Joyce's house and quilts......so inspiring! !